Note from Pauline Durban, Founder and President of Covered Perfectly. Susan from Fifty, not Frumpy always looks amazing and I'm loving her new hair style. She is going to be rocking it at the next photo shoot. 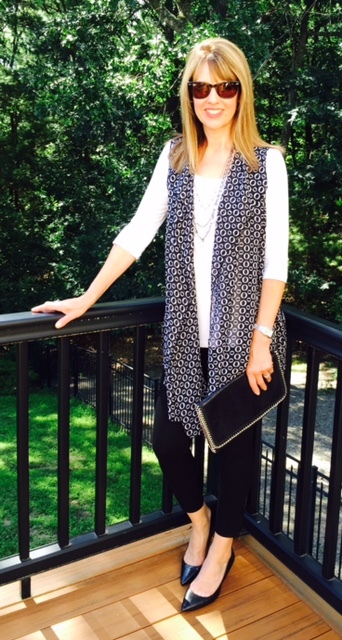 Be sure to check out her blog, Susan shares great styling tips for women of a certain age. The cold shoulder once meant ignoring someone. If you wear these cold shoulder tops from Covered Perfectly you will not be ignored! This entry was posted in Reviews and tagged 50 not frumpy, Fashion for women over 60, leopard print, womens fashion, Chic over 40, Clothing for women over 50, Clothing for women over 40, Style for women over 50, Fashion over 40, clothing women, for women over 50, blouses, womens tops, womens clothing, Fashion for women over 40, free shipping, made in America, Fashion over 50 on August 11, 2015 by Pauline Durban. Social media is an interesting animal. It allows us to keep in touch with friends and family all around the world. We get to see what they have for dinner, what restaurants they are visiting as well as all the amazing pictures of their children, or in our case, it’s often grandchildren. Covered Perfectly has been able to grow by getting the word out, via social media, so for that I will be forever grateful. However: social media also has a dark side. This entry was posted in Articles and tagged fashion made in the USA, Covered Perfectly, clothing for women over 60, MicroModal, Fashion for women over 60, womens fashion, Chic over 40, Clothing for women over 50, Clothing for women over 40, Style for women over 50, Fashion over 40, clothing women, for women over 50, blouses, womens tops, womens clothing, made in America, Fashion over 50 on August 9, 2015 by Pauline Durban. I love the online community. I get to meet so many amazing women! Susan, is someone I met recently and she shared Covered Perfectly with her subscribers. I'm so grateful to these wonderful women for all that they do. Here's what Susan had to say! You know how difficult it is to find the perfect tee? It's especially tough to find one that's long enough to wear with leggings. And then there's the arm thing...not all of us midlifers are comfortable baring our arms-- and it seems that everything is sleeveless these days! Well, I have the perfect solution.I discovered a company called Covered Perfectly and all of their tops have SLEEVES! This entry was posted in Reviews and tagged Fashion for women over 60, womens fashion, Chic over 40, Clothing for women over 50, Clothing for women over 40, Simple Comfort, chiffon vest, Style for women over 50, Fashion over 40, clothing women, for women over 50, blouses, womens tops, womens clothing, Fashion for women over 40, free shipping, made in America, Fashion over 50 on August 4, 2015 by Pauline Durban. Note from Pauline Durban, Founder of Covered Perfectly. I love my online friends. Jennifer has a great site, A Well Styled Life where she shares inspiration and style tips. Below is a review on the very popular "Simple V", I'm sure you will agree she looks fabulous. IS THERE A PERFECT T-SHIRT? I love T-Shirts. My standard uniform when I’m bopping around the house or running casual errands is usually skinny black pants or jeans, and a T-Shirt. I always wear jewelry, usually a hat and often a scarf. I’ve seen lots of reviews of the Covered Perfectly T-shirts and wondered what all the hoopla was about. When they asked me to review one, I hesitated. I’m skeptical and won’t review or endorse something I really don’t like. I decided I’d get the shirt, but if it arrived and the quality was lousy, I’d send it back, “thanks, but no thanks”. I assume you can guess…I really like the shirt! The fabric is MicroModal which is smooth, soft and breathes. It has great “memory” which means it has enough spandex to retain its shape. This entry was posted in Reviews and tagged Fashion for women over 60, womens fashion, Chic over 40, Clothing for women over 50, Clothing for women over 40, Style for women over 50, Fashion over 40, clothing women, blouses, womens tops, womens clothing, Fashion for women over 40, free shipping, made in America, Fashion over 50 on August 1, 2015 by Pauline Durban. Sylvia currently lives in Singapore, although she has lived all over the world. I met her online and she has featured Covered Perfectly a number of times. Here's one from 2014. I do want to point out that the second top that Sylvia reviewed, the leopard print top is very low on inventory, and once it's gone there will be no more of the identical print. If you like it buy it now. Enjoy the article. Creating 5 outfits with 2 Covered Perfectly tops! I have talked about Covered Perfectly tops a few times before, but I have never showed you wearing them myself. That all changes today with 5 combinations created with 2 Covered Perfectly tops. As the name suggests, Covered Perfectly tops were especially created to cover you perfectly. The tops always aim to present you in your best light. This entry was posted in Reviews and tagged leopard print, tops, womens fashion, Chic over 40, Clothing for women over 50, Clothing for women over 40, Cover your tummy, Style for women over 50, Fashion over 40, clothing women, for women over 50, blouses, womens tops, womens clothing, Fashion for women over 40, free shipping, made in America, Fashion over 50 on July 30, 2015 by Pauline Durban. Note from Pauline Durban, Founder of Covered Perfectly. I sent Adrienne , from The Rich Life a Simple Comfort to try last year. She has since purchased more tops, which is great compliment. I'm sure you will agree that she looks amazing. Be sure to check out her blog for great styling ideas. You know that piece of clothing in your closet that you catch yourself reaching for almost every day? And when you realize it’s in the wash and you’ll have to find something else to wear, you kick yourself for not doing your laundry the day before? That’s how I feel about my Covered Perfectly Simple Comfort top. Since I received one last month from Founder and President, Pauline Durban, I have worn it at least twice a week, if not more. Pauline created Covered Perfectly in 2012 when she became frustrated with tops that had sleeves and bodies too short to cover her arms and torso. Instead of making do with the available choices on the market, she took action and now she has her own her own line of tops with flattering ¾ length sleeves, longer than average torsos and a super soft, high-quality MicroModal® fabric. This entry was posted in Reviews and tagged Tall women, The Rich life on a budget, Chic over 50, babyboomer fashion, MicroModal, Chic over 40, Clothing for women over 50, Clothing for women over 40, Simple Comfort, Style for women over 50, Fashion over 40, clothing women, for women over 50, blouses, womens tops, womens clothing, Fashion for women over 40, made in America, Fashion over 50 on July 29, 2015 by Pauline Durban. Note from Pauline Durban, Founder of Covered Perfectly. Susan has become a good friend of mine. She carries herself with such grace and dignity, I’m honored that she loves her Covered Perfectly tops enough to join us on our last photo shoot. The good news is that she’s coming back for the next one! Thank you Susan for all that you do. A wise woman knows how to draw attention to what she considers her best feature and away from what she isn't fond of. Because of my round face, I always enjoy wearing a V-neck top. The straight lines of square sunglasses offset my round face, as do the straight lines of a V-Neck top. This beautiful royal blue V-Necktop is from Covered Perfectly. This entry was posted in Reviews and tagged chiffon vest, Style for women over 50, Fashion over 40, clothing women, for women over 50, blouses, womens tops, womens clothing, Fashion for women over 40, free shipping, made in America, Fashion over 50 on July 21, 2015 by Pauline Durban. Note from Pauline Durban, Founder/President of Covered Perfectly. as well as great fashion tips. Be sure to check out her blog. Also please like her Facebook page. Here's what Susan had to say about the Mandy design. This entry was posted in Reviews and tagged Mandy design, Style for women over 50, clothing women, for women over 50, blouses, womens tops, womens clothing, Fashion for women over 40, free shipping, made in America, Fashion over 50 on July 3, 2015 by Pauline Durban. Ginger Burr, President of Total Image Consultants and author of ‘That’s So You!’, helps women create a wardrobe they love by connecting with their inner essence. She’s been interviewed by Worth Magazine, Forbes Magazine and Bloomberg Business Week. I promise you do not have to feel relegated to baggy tent-like tops or wear massive amounts of shape wear to trim your tummy. There are great styles available to camouflage and still feel comfortable and attractive. And, as a recent guest on the ‘Mass Appeal’ (daily lifestyle program) TV show I was able to go relatively in-depth (at least for television – they actually allocated 6 minutes which is an amazingly long segment in TV time) for me to address this subject. They must have known it’s a hot topic! Here’s your chance to discover the 7 tips for dressing to hide your tummy and still feel great about how you look. The third women's top featured in the video is the Mandy design from Covered Perfectly. Click here to check it out. There are also many prints to choose from, as well as ruched designs. Thank you Ginger for including us, we feel very honored! This entry was posted in Reviews and tagged Mandy design, Cover your tummy, clothing women, blouses, womens tops, womens clothing, Fashion for women over 40, made in America on June 27, 2015 by Pauline Durban. Many of you have asked me about the Covered Perfectly tunics ever since I was in California to model for the line earlier this year. Today I thought I would show you the two pieces I get the most questions about. This entry was posted in Reviews and tagged chiffon vest, Style for women over 50, Fashion over 40, clothing women, for women over 50, blouses, womens tops, womens clothing, Fashion for women over 40, free shipping, made in America, Fashion over 50 on June 21, 2015 by Pauline Durban.